Austin has a lot of delicious eats within its city limits that it’s known for including it’s obsession with breakfast tacos, where you can try out a different spot every day of the week. There’s also Texas BBQ, including fall-off-the-bone brisket which is truly king down in Austin. So loosen your belt and get ready to explore a few of the best places to eat in Austin that are worth checking out. 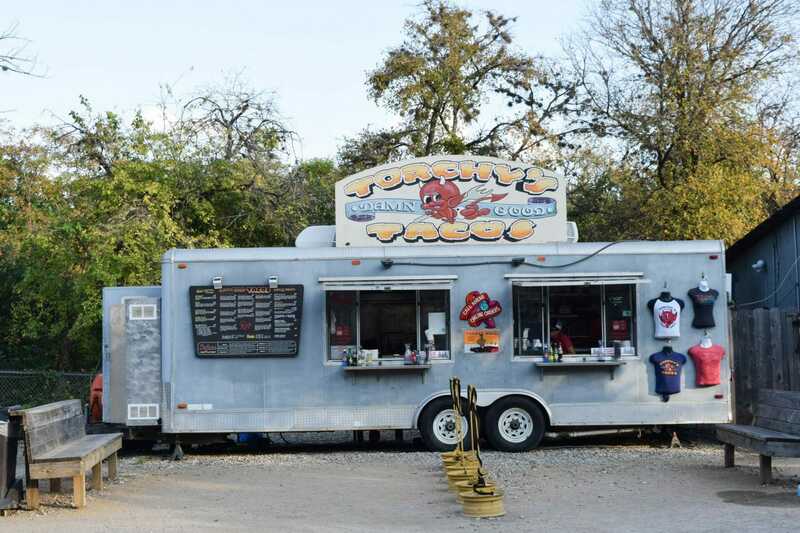 Austin has its fair share of excellent taco spots and Torchy’s is one of them. The original Torchy’s Tacos food truck on South First Street (that is sadly now closed) and has spread through Texas and beyond. Their Crossroad smoked brisket taco sets the bar high with tender meat and generous portions. For vegetarians, there’s plenty of options like the Fried Avocado, with pinto beans and pico de gallo. Don’t miss out the delicious hearty breakfast tacos. There are branches all around the city, from the spacious one near the University of Texas, to the hard-to-miss location on South Congress. Consistently good breakfast tacos, strong coffee (try their Belgian Bomber, a less sweet version of their iced turbo coffee), and one of the best outdoor patios around to take your sweet time on and watch the world go by on South Congress. The Instagram popular “I love you so much” is on the side of the café and a great spot to document your visit. Get in line early to beat the morning rush. There’s a second branch downtown that serves hamburgers and ice cold beers, as well as their signature Intelligentsia coffee. Holy hipster this spot makes dishes so flavorful, that the fact their menu is completely vegetarian is secondary. Head over there after the Continental Club on South Congress, where you can grab a late night bite like the Warm Harvest Bowl with roasted brussel sprouts, sweet potatoes, squash, garlic and kale. This place screams Austin, from its disheveled waiters to its quirky, mismatched décor. If you there for brunch, don’t skip over the tofu scramble for breakfast, which has spices that are seriously magical. For a brunch spot that serves up healthy, hearty food in the heart of downtown, this spot is a solid choice. Grab a spot on the leafy patio that is perfect for taking your sweet time to enjoy your meal. There are plenty of gluten-free options, including the avocado toast and buttermilk waffles. Delicious lunch and dinner options are also available in the form of burgers, salads and sandwiches. Classic cocktails from the bar round out the meal. Two-hour parking validation is available in the nearby San Jacinto Center garage after 5pm on weekdays and all weekend long. For solid breakfast tacos this popular spot is not to be missed. There are healthy options (spinach and egg whites) or more traditional options like The Jess Special (migas, jack cheese, avocado). There is also a build your own option, where you can pile ingredients like homemade chorizo, queso fresco, and jalapenos. A majority of their tacos are gluten free, since they use 100% corn tortillas. Open 7 days a week until 3pm, but get there early to beat the breakfast taco rush (open 7am on weekdays and 8am on weekends). When you’re in Austin, you cannot pass up on Texas-style BBQ. This local favorite spot serves up mouth-watering brisket, and ribs by the pound, as well as plenty of grab-and-go sides like green beans, coleslaw, mac and cheese, and potato salad. The restaurant is set-up cafeteria-style, where you grab a tray and take your meat, sides, and drinks along the line. This is a great alternative to other BBQ places that have eternally long waits, although Micklethwait is a good alternative (just get there bright and early). Yulia of That’s What She Had recommended this spot to meet up, promising that it was as Austin as it gets and she wasn’t joking. From the extensive outdoor seating where you can soak up the warm Texas sun surrounded by a collection of eclectic trinkets, to the cozy nooks and crannies in the interior, this cafe is a great place to spend a few hours nursing a cocktail or a cup of tea. Sandwiches, salads, and soups are also available. Service is sloth-like, but the atmosphere make up for the slow service. Open until 2am daily. This is a casual breakfast spot in Bee Cave to grab excellent breakfast tacos alongside college students in their sweats. The breakfast tacos are customizable, where you can add decadent ingredients like queso, bacon, eggs, and baked potato hash. If you want something besides breakfast tacos, the breakfast roll that comes with a fried egg, cheese and your choose of meat is a great alternative. Don’t miss their homemade sides and soups like apple slaw, pulled pork, shells and cheese, and ham bone soup. I wasn’t in Austin nearly long enough, and there was so much more that I wanted to eat, but there simply wasn’t enough time (or stomach space). Veracruz All Natural was on the top of my list, but we just didn’t make it. I came across an interesting article on one of my last days in Austin, that highlighted Veracruz and some other businesses within Austin food scene that aren’t always given their due credit. Definitely an interesting read.